When it comes to makeup and hair products, we have a lot to thank our ancient counterparts for, such as discovering coconut oil and henna, but they also had a few methods I’d be reluctant to use. Here are the top 10 ye olde beauty products that you shouldn’t try at home. You know that kohl eyeliner that you have? The core ingredient in it is galena, AKA lead sulphide. This was used all over the ancient world; Egypt, the Middle East and even Elizabethan England, to name a few places. Even today it is still used in parts of Africa and Asia. Don’t stress, the kohl eyeliner we use in stores is kohl in name only, but it is worth checking the ingredients because the health standards of the country of manufacture determine whether they use real kohl or a substitute. Gross, I know, but it happened in Edwardian England (I’ve decide that the beginning of the last century is ancient now). 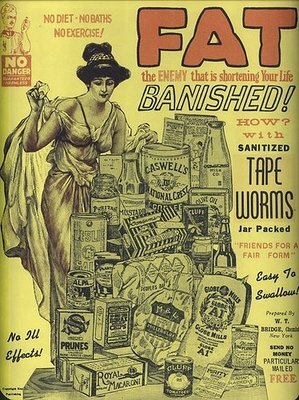 You can probably guess how it works – the lady swallows the tapeworm, the tapeworm consumes what she consumes and the carbs stay away from her thighs. You know, I think I’d rather try Jenny Craig first. You know that lovely glow that pregnant women have? Well, in Elizabethan England some ladies wanted to have that glow all the time and achieved it by eating arsenic laced foods. They also rubbed it on their faces in a mixture with chalk and vinegar as a way to turn the skin whiter and prevent aging. Rather than pop into the hairdresser and spend $100 having highlights put through your hair, here’s an idea for you – just dip it in lion urine and sit out in the sun for a while, like the Venetians did. As far as my research has led me to believe, the urine itself won’t do any damage, although the acquisition of it may. Get home from a night out to find you’re out of makeup remover? No worries, take a leaf out of the book of Geishas and early Kabuki performers. Just pop out the back, find some nightingale droppings and hey presto! Rumour has it that Tom Cruise uses this in an anti-aging mixture too. Really. Like the Venetians, the Arabians also liked to use urine in their hair. Turns out, they were onto something. It’s the high levels of potassium in camel urine that makes it great for hair, hence why you see it in a lot of our hair products. Lipstick you can make at home! Cleopatra did it, ladies in Elizabethan England did it and now, you can do it too! No, really, you can, because some lipsticks still contain carmine, which is a red pigment obtained from some scaled insects. Speaking of Cleopatra, know what she used as a facemask? Crocodile dung mixed with donkey milk. Once I used a face mask and was a little careless, so some got in my eye. Thankfully it stayed out of my mouth. I’m just concerned for her because accidents do happen. I can only imagine that the theory behind this Roman one was that the ash would dry the skin out, but why snail? Well, we’re not sure. Surely caterpillar, or spider, or you know, wood, would have been just as (in)effective. The Romans did this. It actually makes sense to me, you know, ashes to ashes, dust to dust and all that jazz. In way it makes the process of receiving something false more organic. Unless it’s Uncle Robert that you’re chomping away with. It’s said that Cleopatra used to bathe every evening in asses milk. These days they actually market raw (unpasteurised) milk as a beauty product, which I find horribly wasteful. (Look out for products like ‘goat milk soap’ and ‘body cream’ and ‘bath milk’ if you like the idea of a natural beauty treatment… or you want to make cheese with unpasteurised milk). ‘Please do not put beer in my hair’. This entry was posted in Culture, Featured and tagged beauty tips, lip top 10. Bookmark the permalink.